I spent last week immersed in content marketing at Content Marketing World in Sydney. It was the first time Australia has had a conference of this size with so many international thought leaders and major brands speaking about how to achieve success with content marketing. 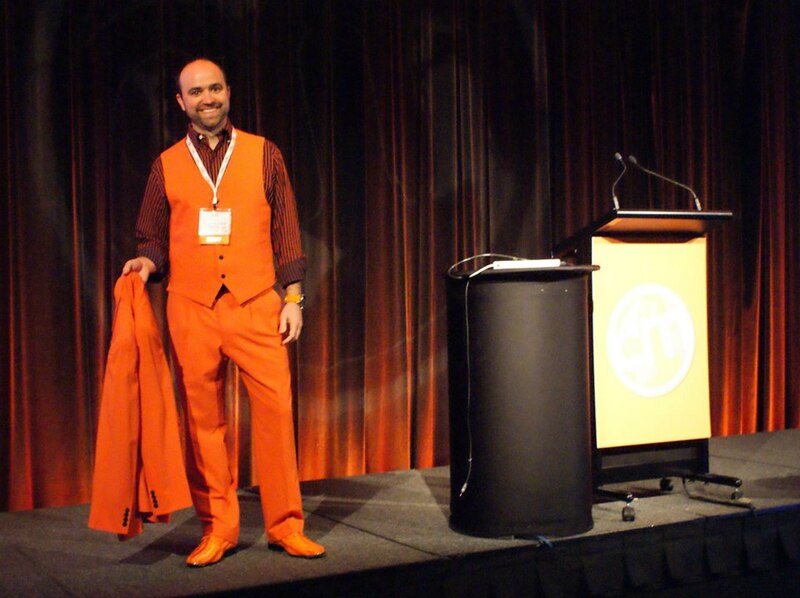 Joe Pulizzi, founder of the Content Marketing Institute and host of the event launched the conference with a wardrobe branding exercise like none of I’ve seen before. (see below) Here are some of the consistent themes that came out of the sessions I attended. One of the big complaints I hear about content marketing is it’s not ‘real’ marketing. Nothing could be further from the truth. Without exception, every speaker talked about content marketing in strategic terms. Few of them discussed tactics and when they did, only in support of a wider marketing strategy. The message was loud and clear that everything you do with content marketing has to be attached to and driven by business objectives. A good example of this was Julie Fleischer, Director of Media and Consumer Engagement from Kraft Foods Group in the USA. She directs millions of dollars in media across television, print, digital and social channels. Kraft’s content marketing is responsible for connecting millions of consumers every month equating to more than 50 million unique user visits to their website every year. Content marketing activity also drives more than 1 million paid subscribers to their online magazine. Julie provided a content quadrant to help marketers become better at executing their strategies which absolutely rocked the house. I’ve never spoken to a client who has the budget they want. I chalked that up to the fact most of my clients are new to content marketing or haven’t been able to convince the C-Suite that content marketing is a good place to spend money. But guess what? It seems like no one has the budget they would like. American Express, Kraft and Kelly Services all spoke openly about budgets and the struggle to get a bigger slice of the pie. Julie Fleischer explained it by reminding everyone that organisations do what they’ve always done and aren’t likely to generate additional budgets for content marketing even when it’s clearly working. More likely, content marketers are going to have to make a case for reducing budgets in another area like PR or advertising. It’s another indicator that the C-Suite needs to be sold on a content marketing strategy. Everyone, but everyone, talked about the importance of activity. Creating a strategy, developing content and posting it on your website is only the start of your job. The real work begins when you decide to become an active part of your own conversation. One important distinction in this, however, is a move away from the ‘more’ of content marketing. In Robert Rose’s examples, website traffic dropped but conversions went up. He wasn’t the only person making the point that quality trumped quantity and volume for the sake of ‘more content’ was detrimental to your brand. As a side note, where Robert stood alone was at the end of his presentation on “Integrating Content Marketing into Your Existing Marketing Efforts”. Not a single person asked a question. We sat in a collective stunned silence at what was arguably the best session of the whole conference. 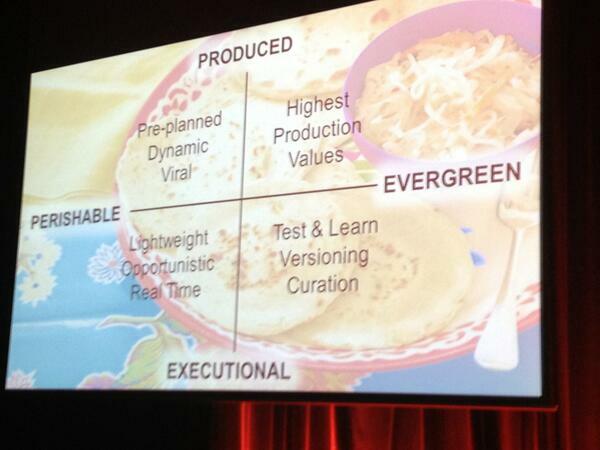 His call to action to tell better stories, be better marketers was inspiring and confronting in equal parts. I said it in my Content Marketing 101 workshop held the day before the conference started and it was supported in nearly every session. Content marketing is a slow burn method of marketing. It takes longer to see results, it’s harder to get right and requires more attention than other strategies. It also gives brands much more control and leaves them with a tangible asset for their business that continues to attract prospects long after the budget is spent. It also has a higher conversion rate, is more targeted and creates brand evangelists in a way traditional marketing and advertising can’t do. More than 70% of people in the 18-35 age group use mobile devices as their primary access method. Mobile usage is increasing in every other demographic. Usage of laptops and websites is on the wane. Tablets are overtaking mobile phones as the preferred way to access the internet. Social media sites are just as important to search as Google, Yahoo and Bing. Joe Pulizzi was the first to speak about the importance of eliminating barriers to your content. His theory is you have to give good stuff away to get business back – a ‘give to get’ strategy. The sentiment was echoed throughout the conference. Both research and anecdotal evidence of the speakers proved the more walls you put in front of consumers, the less likely they are to read and share your content. Lengthy forms impede content distribution because people don’t want to give their details away. If they’re not getting access to your content, you’re losing out on business. One of the best discussions around this was in Jonathan Crossfield’s session on building an audience with content marketing. His Lessons from the Nightclub Dance Floor presentation drew excellent (and fun) parallels between the work of a content marketer and that of a DJ in a bar. The role of the DJ is to fill the dance floor which, in turn, drives the sale of drinks – the real business of a bar. People will come to hear the DJ but they won’t all necessarily buy drinks. But in Jonathan’s experience, when the bar tries to cash in on those non-drinking music lovers by instituting a cover charge at the door, the bar receipts decrease in greater proportion than the additional revenue generated by the cover charge. Why? Because people go somewhere else to listen to music and they take their drinking friends with them. I’m still trying to digest everything. Robert Rose urged us to let the lessons settle in and I’ve taken his advice. Joe Pulizzi also urged restraint and suggested we not to try do ‘everything’ but to do ‘something’ in the form of one or two changes. I’m reading the Managing Content Marketing book Joe and Robert wrote to reinforce some of the lessons. I have Todd Wheatland’s book on Slideshare queued up next. I can’t recommend Content Marketing World enough. I’ve been to a lot of conferences in my career but never one so valuable and so jam-packed with tangible advice. The speakers gave their secrets away – as I did in my workshop. The collective value of all that experience far exceeded the cost of attending. The networking opportunities were fabulous and I really enjoyed meeting people I’ve known for years through social networking. It was one big connected, talky tribe of marketers – both experienced and brand new to the industry. We all had a lot of fun. Put Content Marketing World on your calendar for September if you can make it to the USA or next March when it will come back to Australia. What did you take away from Content Marketing World?